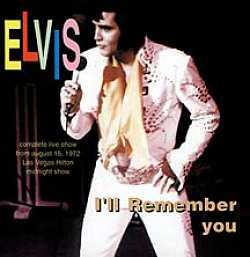 This disc documents the September 4, 1972 dinner show from the Las Vegas Hilton. Rock Legends says otherwise, but they aren't even close. This was a very interesting season for Elvis as he introduced four new songs to his stage set and all were excellent songs that he would perform continually over the next few years. These new songs consisted of: 'Steamroller Blues' (done only once? ), 'My Way', 'What Now My Love' and 'Fever' (first live performances). The season started off on the weak side as Elvis had the flu on opening night, but he quickly shook it off and gave some outstanding performances throughout the engagement. There is also quite a bit of film from this season available on video tape. The show starts with the usual '2001' and 'See See Rider' opening, and the thing I always liked about this particular season is that the rhythm section gets going before the horns chime in. 'Johnny B. Goode' follows and this is highly unusual as 'I Got A Woman' or 'Proud Mary' was the usual follow on. Next are two recent hits: 'Until It's Time For You To Go' and 'You Don't Have To Say You Love Me'. Both are well done. 'Polk Salad Annie' gets the temperature rising, but this is about the time he started doing a split in the middle of the ending instead of cranking up the wild thang to full throttle. After that Elvis welcomes the audience while he catches his breath, then performs a strong version of 'What Now My Love'. Next follows an extended string of hits beginning with a sensual 'Fever', and then 'Love Me', 'Blue Suede Shoes', 'Heartbreak Hotel', 'All Shook Up', 'Love Me Tender', 'Teddy Bear/Don't Be Cruel', 'Little Sister/Get Back', 'Hound Dog' and 'I'll Remember You'. Elvis then introduces J.D. Sumner and asks him to sing 'Walk That Lonesome Road' which he wrote. The song showcases J.D. 's wonderfully deep voice and gives the Stamps a chance to shine as well. 'Suspicious Minds' is next and then Elvis introduces his band and a fan club from England with 250 members in the audience. Elvis finishes off his set with excellent performances of 'For The Good Times', 'Big Hunk O' Love', 'You Gave Me A Mountain' and finally 'Can't Help Falling In Love'. A nice show, but I think Elvis was starting to tire at the end of this season. Two shows a night for 28 days will take it's toll on anybody, add to it the monotony of living in a hotel and you have a good recipe for insanity. The sound is good, but not as good as other soundboards available as there is some hiss and the overall level could have been higher. But this is a nice addition to your collection with the dinner and midnight shows on August 11th. Elvis is still in his prime and giving 110% and that's all anybody can ask for. © Mark Littlejohn, USA - November 2001. This CD contains a soundboard recording of the dinner show at the Las Vegas Hilton on the 4th September 1972 and not the midnight show of the 15th August as stated on the cover. There are several reasons for querying the date of this show. Firstly, he greets the audience with "Good afternoon" and crucially, the British Elvis Presley fan club are present this evening, which pinpoints the actual date of the show. This performance immediately follows one I reviewed earlier, under the title King Of The Neon Jungle, Whereas that was taken from a good audience recording, allowing us to clearly hear the crowd reaction, this soundboard allows us to enjoy this set list the next day in better quality. The sound is reasonable for a soundboard recording but levels do fluctuate throughout the show with a lot of hiss evident during low level passages. The ballads in particular suffer in this respect. The audience is also low in the mix, as is often the case with shows recorded from the mixing desk, which does reduce the excitement of the occasion a little when compared to the former show. The show opens with a good 'See See Rider' and a rocking 'Johnnie B. Goode', featuring a great guitar solo from James Burton. The sound level then drops for a hissy 'Until It's Time For You To Go' with the usual great backing from Kathy Westmoreland. The sound is better for 'You Don't Have To Say You Love Me' and 'Polk Salad Annie', both of which are good versions. Elvis then welcomes the audience to the Hilton Hotel [this afternoon] adding "I'd like to get serious for a moment", leading into a hissy 'What Now My Love', although the sound improves for a powerful ending. Likewise, 'Fever' is a quieter song where the hissing detracts. The sound improves for the 50's hits which are performed in quick succession as was usual at this time. They are all reasonable versions, with 'All Shook Up' featuring some great boogie piano playing and a very tight paced 'Little Sister/Get Back' medley. He teases the audience during the start of 'Hound Dog' with "You ain't nothing but....an aardvark, bushog, warthog, cricket, frog, bushbaby...." before starting a mid tempo 'Hound Dog' leading to a throwaway fast version, where the lyrics are spoken rather than sung in parts. The sound level and quality drops for 'I'll Remember You', which is hissy and almost an orchestral version, as the rhythm section is very low in the mix. JD Sumner and the Stamps are featured in JD's own composition- 'Walk That Lonesome Road', which to me is spoilt by JD's attempt to hit an extra low note, as it breaks up the rhythm. It seems that the Stamps also had to contend with Elvis' practical jokes during their performance, as he says afterwards "Thank you fellas...sorry you got a little wet there, nothing personal." This presumably refers to his habit of throwing cups of water at his stage crew during the show. The pace picks up for a good 'Suspicious Minds' which is followed by the band introductions. At the end Elvis acknowledges the presence of between 200-250 members of the English fan club and thanks them for coming over. A low level mix and hissing once again spoil 'For The Good Times' but the sound improves for an excellent 'Big Hunk Of Love', with Elvis calling out "piano" before Glen's solo and "James" before the guitar break. Glen Hardin really shines on this one and it's a great version. The earlier comments on variable sound apply to 'You Gave Me A Mountain', which ends with Elvis commenting on it being a good song. He introduces his closing song by calling out "Blue Hawaii" and the sound is better here. It seems that this is in fact, a track "borrowed" from the Fort Baxter release, Elvis At Full Blast, which has been edited in to complete the concert. 'Bosom Of Abraham' and 'You Better Run' are included as bonus songs from a show in Alexandria on the 29th March 1977. Elvis sounds in good voice, singing bass to Charlie Hodges lead but unfortunately these recordings suffer slightly from feedback. Still nice to have though. In conclusion, Elvis is relaxed and in good spirits for this show, which unfortunately is let down by hissing and variable sound levels in places. However, this is the only soundboard from the latter part of this season to feature this opening sequence of songs [so far] and 'A Big Hunk Of Love' is a great version. For these reasons, I recommend it, making a desirable addition to any collection.